Good morning, everyone! 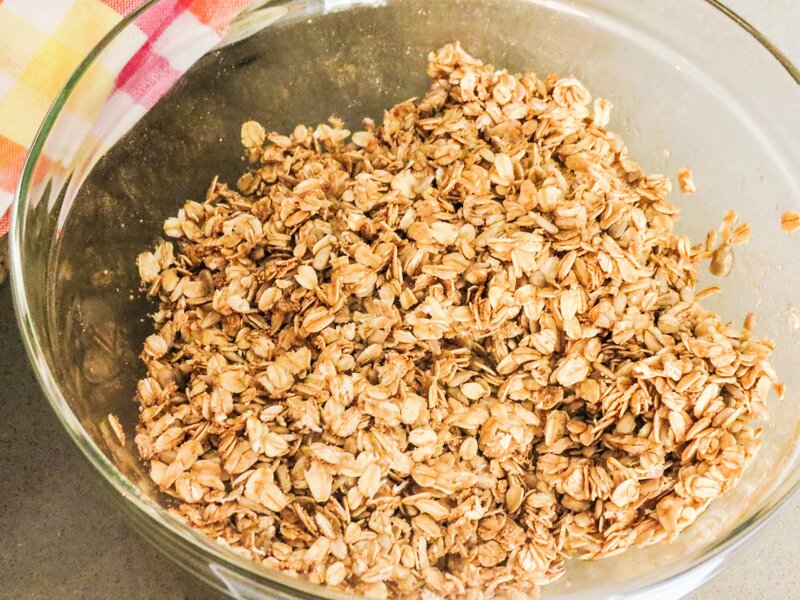 I’m usually not a morning person, but here I am today to share with you an easy homemade granola recipe. Even nowadays, I can easily sleep past noon. However, the days I do wake up early I feel the benefits of the morning. My body feels better and so does my mind. I also get more things done, which is awesome. Now that I’ve been blogging constantly, I’ve been trying to wake up early so I can use daylight to photograph my dishes, as it makes a huge difference. And I started appreciating a good breakfast, something I had forgotten long ago (since I used to wake up at lunch time). The next recipe I’m making requires granola, so I figured why not make my own? It is so easy to make and you can even save money making your own, especially with the price of granola in the markets nowadays. The recipe asks for rolled oats, but you can use any type of rolled grains you want. 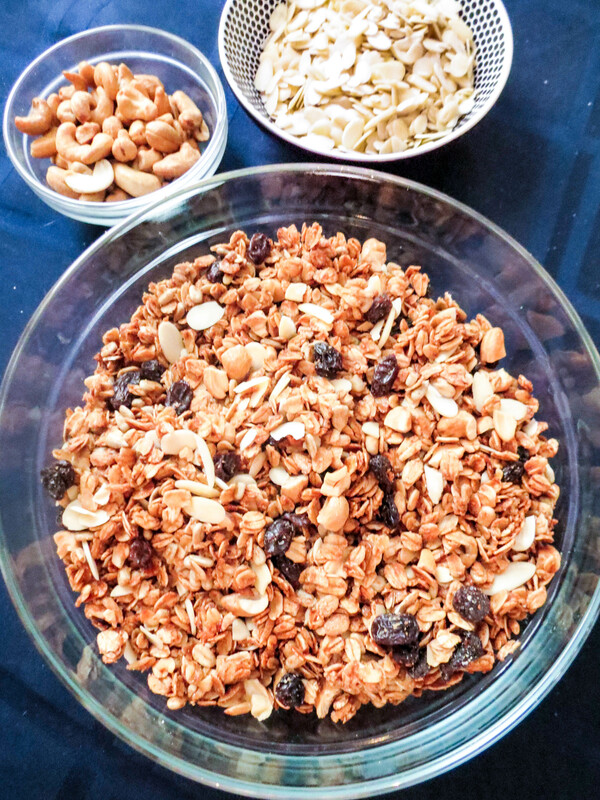 You can also fully customize your granola according to your own taste, as there are so many dry fruits, spices and nuts available! Start by pre heating your oven to 300 degrees. In a bowl, combine the rolled oats, the raw sunflower seeds, the cinnamon, the salt and the brown sugar. Set it aside. In another bowl, combine the oil, the vanilla and the honey. Whisk to combine. Spread the mixture into a baking sheet (coated with non stick spray) creating a thin layer. Bake for around 15 minutes, stir and then bake again until golden brown. Mine was light golden brown in 5 minutes. While you let the oats cool, mix the chopped nuts and the raisins in a medium bowl. The oats are going to harden as they cool down and you should stir them every now and then. Mix everything together and your granola is ready! You can store it in an airtight container for up to 2 weeks. Pre heat your oven to 300 degrees. Combine the oats, the sunflower seeds, the cinnamon, the brown sugar and the salt in a medium bowl. Set it aside. In another bowl, whisk together the oil, the vanilla and the honey. Pour the liquid mixture into the oat mixture and use your hands to combine. On a baking sheet (coated with non stick spray), spread the mixture into a thin layer. Bake it for 15 minutes, stir, and then bake it again until light golden brown (5 to 20 minutes). While the granola cools down, mix the nuts and the raisins in a medium bowl. Once the granola is at room temperature (it will harden as it cools), mix with the nuts and the raisins. Store for up to 2 weeks in an airtight container.